Given recent setbacks, will the Trump administration make headway on taxation? The stock market is up after Trump’s election as “animal spirits” were initially aroused with the promises of a repeal and replacement of Obamacare, a tax reduction, a large infrastructure program, and a lighter regulatory burden. Since the health care bill appeared likely to fail and was pulled, the market ebullience has faded. 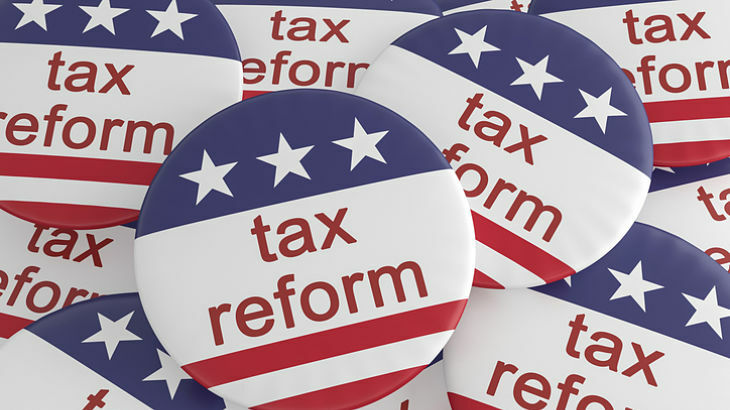 It now appears, the focus of the Trump administration would naturally shift toward lowering tax rates although there is still talk of trying to resuscitate the health care effort and finish it before changes would be instituted in the tax area. President Trump also said “Right now, American companies are taxed at one of the highest rates anywhere in the world”. The United States historically has had a consistently steady but very high corporate tax rate despite the pattern of other countries which have dramatically lowered their rates over the past 10 years, thus the widening of the competitive disadvantage. As can be seen in the chart above from Cornerstone Macro, the United States currently has a combined rate of 39% consisting of a 35% federal tax rate plus the average tax rate amongst the states while others in the OECD have a rate of only 25%, which is 14 points or about 35% lower on a stated basis. 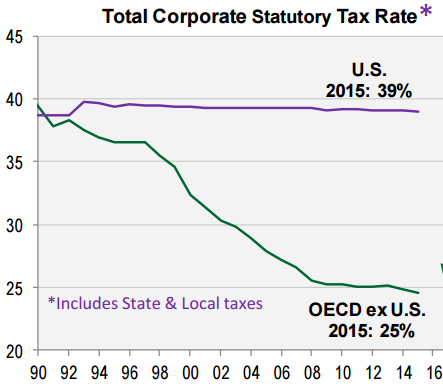 The United States, with its corporate tax rate at 39%, now has the HIGHEST corporate tax rate amongst the 35 member countries of the OECD or amongst the G20. Widening the lens, the US corporate tax rate amounts to the 3rd highest amongst 188 countries in the world. Only the United Arab Emirates and Puerto Rico have higher rates than our country. President Trump campaigned on a promise of a 15% corporate tax rate while the House in its “Better Way Forward” program has proposed a 20% rate. We believe either end of the numbers would be a welcome change given where the USA rate of 39% stands in the world today. As the debate heats up on taxes, people will take sides on whether to evaluate tax reform on a “static” or “dynamic” basis. Those who favor a static approach will cite budget concerns and will want dollar for dollar offsets to “pay for” the tax cut because they don’t factor in any changes in behavior, nor do they factor in any change coming from the impact of faster growth that would result from the reduction in rates. Those who favor dynamic scoring have a number of terrific examples of programs to examine that worked very well where corporate tax rates were sharply reduced while “collected” taxes rose. The first observation one would make from the table above is how small the percentage of collected corporate taxes are relative to GDP. That is because so much of the collected taxes come from individuals, from payroll taxes, from entities like sole proprietorships and from trusts. 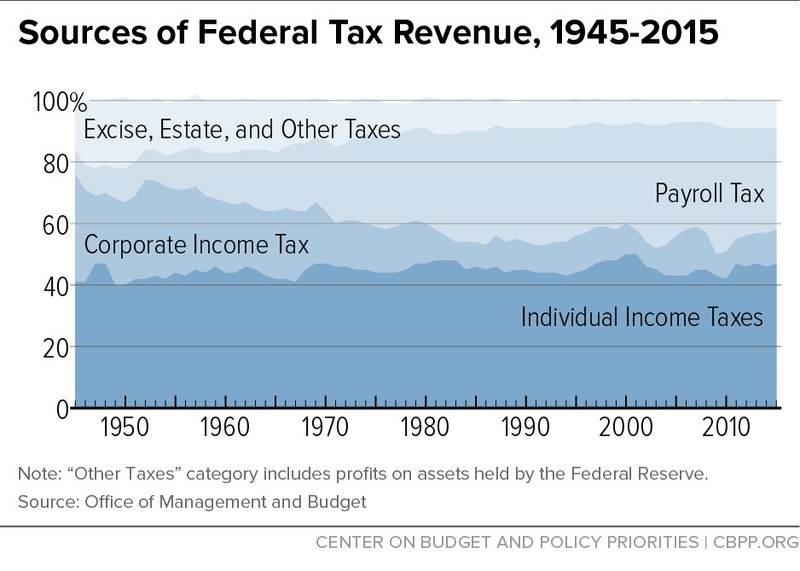 The chart below comes from the Congressional Budget Office and shows the mix of tax revenues in the United States since 1945 and the diminishing contribution of corporate income taxes. Canada is a good example of a country that has dropped its corporate tax rate and increased its revenues. 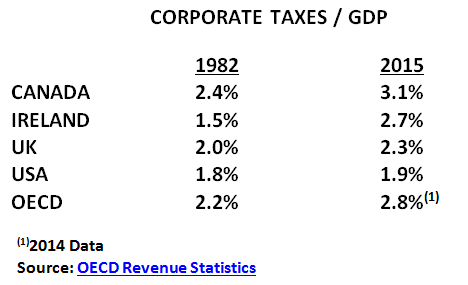 In Canada’s case, their corporate tax rate was close to 50% in 1982 and they have since steadily dropped their rate all the way down to 15% … without a corresponding erosion in collected corporate tax revenues.